DETROIT, MI, May 23, 2017 – Today MBDC, the world’s foremost advisors in material health, product design, and the Cradle to Cradle® Design Framework, announced a collaborative partnership with beauty leader L’Oréal USA with the company’s latest Cradle to Cradle Certified™ products. The scientists at MBDC assessed Biolage R.A.W. Nourish Shampoo and Conditioner across the five rigorous environmental and societal Cradle to Cradle Certified Product Standard categories. L’Oréal’s two products achieved SILVER level certification after years of building a strong expertise in eco-formulation and the use of naturally derived ingredients. Biolage R.A.W. (Real – Authentic – Wholesome) achieved notable accomplishments within the Cradle to Cradle Certified Products Program, including reaching PLATINUM level under the Material Health category with an overall score of SILVER. The Nourish Shampoo with quinoa husk and honey is composed of 77% natural-origin ingredients and the Nourish Conditioner with coconut oil and kaolin clay is composed of 95% natural-origin ingredients. The shampoo and conditioner are both 99% biodegradable and do not include silicones, parabens or artificial colorants. Through L’Oréal’s global Sharing Beauty With All sustainability program, the company has committed that 100% of its products will have an environmental or social improvement by 2020. 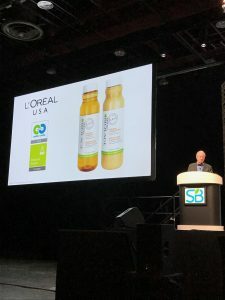 L’Oréal’s announcement of these newly Cradle to Cradle Certified products mark an industry call to action to collectively work toward reducing negative environmental impacts and accelerating design and production for the circular economy. The Cradle to Cradle Certified Products Program is an independent, third-party verified certification program that certifies products and materials that are safe to human and environmental health, designed for future use cycles, and utilizing clean energy and water throughout the supply chain. The program was originally created by MBDC in 2005, under guidance of the firm’s co-founder William McDonough, globally recognized architect and leader in sustainable development, to acknowledge high levels of sustainability being achieved by their clients, and to inspire others to innovate and “rethink the way they make things.” In 2009, MBDC gifted the program to the public with the creation of the non-profit Cradle to Cradle Products Innovation Institute, who now administers the certificates. MBDC continues to be the leading assessor for the program, working with globally recognized companies to assess, optimize and verify that their “goods” truly are good. Cradle to Cradle Certified products are evaluated for material health, material reutilization, renewable energy use, water stewardship, and social fairness. Product certification is awarded at five levels (Basic, Bronze, Silver, Gold, and Platinum), with each higher level imposing a more rigorous set of requirements. The lowest score in any quality category establishes the product’s overall score. Certified products are expected to show continuous improvement every two years. 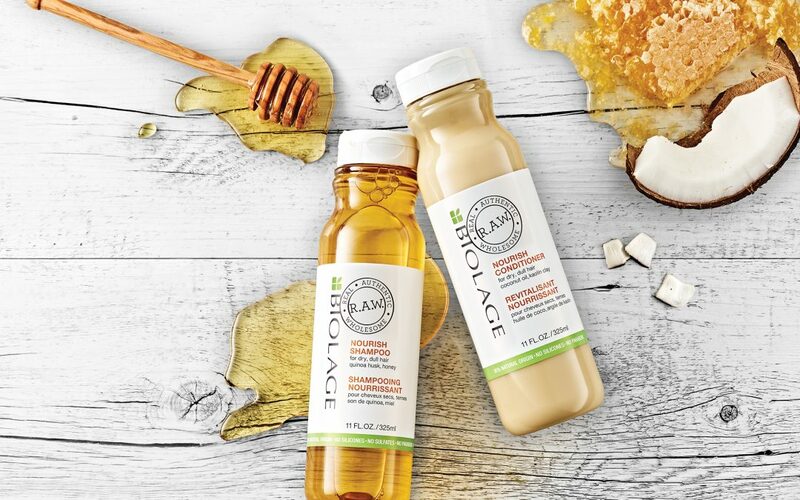 Today at Sustainable Brands in Detroit, MBDC will be giving away 200 samples of the newly certified Biolage R.A.W. Nourish Shampoo and Conditioner at its booth (#1502). Join co-founder of Cradle to Cradle William McDonough, Nour Tayara and Jonathan Maher of L’Oréal USA, Jay Bolus of MBDC, and Stacy Glass of the Cradle to Cradle Products Innovation Institute at the booth today at 2:45p for a joint announcement on the new certifications. The MBDC booth is located in the Good Supply Chain/Materials/Technology pavilion in the Activation Hub. Biolage R.A.W. Nourish Shampoo and Conditioner can be found online and in markets worldwide. For more information on MBDC and how to begin the optimization process for your product or material, please contact us today. MBDC is a firm founded in 1995 by world-renowned architect William McDonough and chemist Dr. Michael Braungart. MBDC originated the Cradle to Cradle® design framework and the Cradle to Cradle Certified™ products program. MBDC leads companies to create a world of good by assessing product designs and integrating the framework into corporate strategy, communications, operations, and supply chains. Using the process of inventory, assessment, and optimization, MBDC provides unique technical expertise to develop sustainable circular economy solutions around material health, material reutilization, renewable energy use, water stewardship, and social fairness. MBDC partners with clients to provide scientific assessments and spur design innovation to create a world of good. L’Oréal USA is the largest subsidiary of the L’Oréal Group, the world’s leading beauty company. L’Oréal USA manages a portfolio of more than 30 iconic beauty brands, including Garnier, Giorgio Armani Beauty, Kérastase, Lancôme, La Roche-Posay, L’Oréal Paris and Yves Saint Laurent Beauté. L’Oréal USA also serves as the international hub for the product development and marketing strategy for L’Oréal’s American brands: Baxter of California, Carol’s Daughter, Clarisonic, Dermablend, Essie, IT Cosmetics, Kiehl’s, Matrix, Maybelline New York, Mizani, NYX Professional Makeup, Pureology, Ralph Lauren Fragrances, Redken, Softsheen-Carson, SkinCeuticals and Urban Decay. Generating more than $6 billion in sales annually, L’Oréal USA is committed to growth through sustainable innovation, driven by the company’s Sharing Beauty With All ambition for sustainable development across the Group’s value chain. The company is headquartered in New York City, employs more than 11,000 people, and operates administrative, research, manufacturing and distribution facilities across 14 states, including Arkansas, California, Florida, Kentucky, New Jersey, Ohio, Texas and Washington. For more information, visit www.lorealusa.com or follow us on Twitter, Facebook and Instagram @LOrealUSA. Cradle to Cradle® is a registered trademark of MBDC.